You’ve selected your Maltese puppy and you’ve brought him home, only to discover that when it comes to feeding him he isn’t interested in eating what you’ve provided. What do you do? First of all, don’t worry. It’s a known fact that many small dog breeds, especially the Maltese, are known to be picky eaters. Finicky eating may be caused because your dog is overheated or has a medical condition. However, in most cases, a Maltese puppy is only interested in eating certain things. Diet change – Your Maltese puppy may not be eating the food you are providing him if you are giving him food he isn’t familiar with. Although you may want to change your Maltese food to another brand you think is better for your dog, you shouldn’t do this right away. To make the new home adjustment easier for your pup, provide him with the same food he was being fed by the breeder, rescue, etc. Start at the beginning of the week, and keep feeding him his regular food for the first two days. On the third day, mix your dog’s regular food with the new brand. Each day, slowly decrease the amount of old food and increase the new kind. Keep up with this slow switch for a good week. The reason why you should introduce new food to your puppy’s diet slowly is to ensure that he continues to eat properly and also to ensure that he doesn’t develop gastrointestinal upset. Add a bit of moist food with the dry food to make it more flavorful for a while. If after a while your dog still seems to dislike his new food, consider trying a new brand. After all, not every dog will like every brand of kibble on the market. 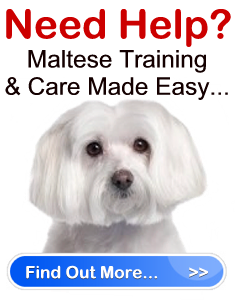 If you have no luck with getting your Maltese puppy to eat, you should speak with his Veterinarian for assistance.